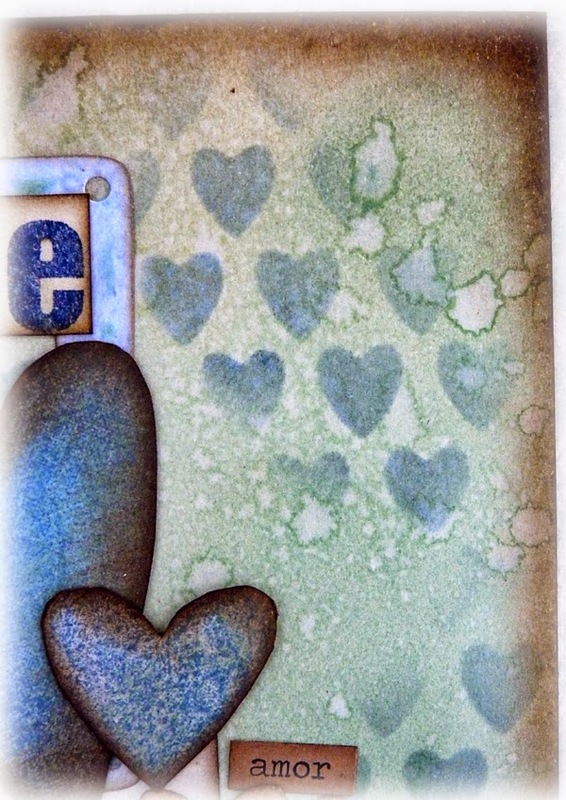 I thought I'd take the non traditional colours for this card having already made an all red one for my hubby. 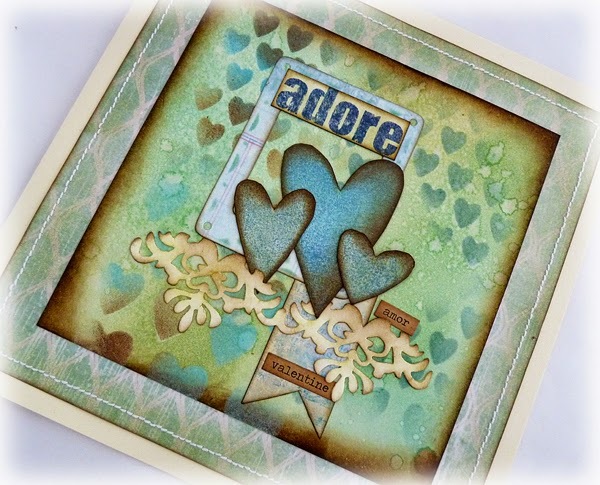 Using Tim’s bundled sage, broken china and walnut stain distress paints, gently pounce them through his hearts stencil using a mini blender. Heat dry. Blend the same colours in distress inks over the whole piece. Spritz and flick water over and dry with a heat gun. Blend walnut stain around the edges. 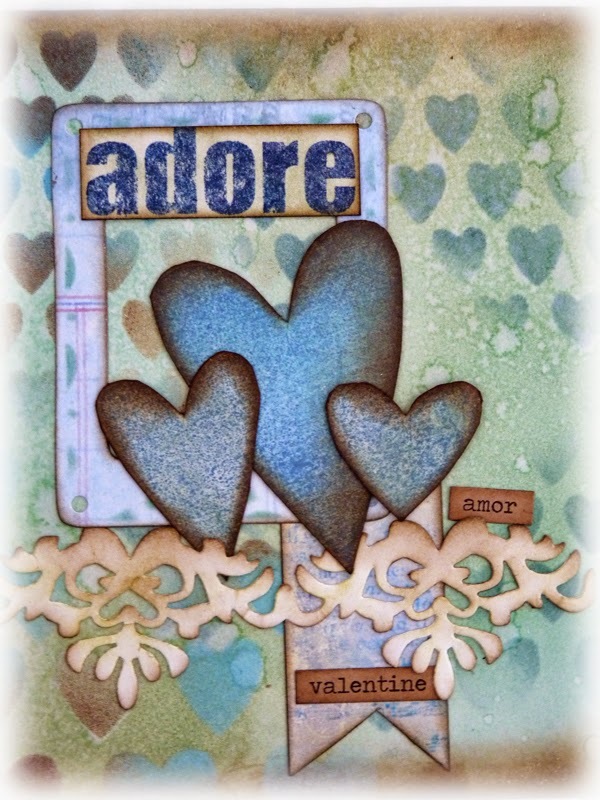 Stamp the hearts from the Valentine Silhouettes stamp set, I used faded jeans and blend broken china over them. Cut them out then edge with walnut stain. Gather some more elements together – a frame, a border, a pennant and a text word – put them together to form your layout. Glue them down and your card is made. Add some chit chat stickers, glue it all to a piece of patterned paper and you have an 8 x 8 card to give to your loved one. Thank you for stopping by and don't forget I have a giveaway open to all followers to celebrate my 5 year blogaversary and 1000 posts, I would love you to enter. Listen to your heART and have a great day. Love the non traditional colours of this one! 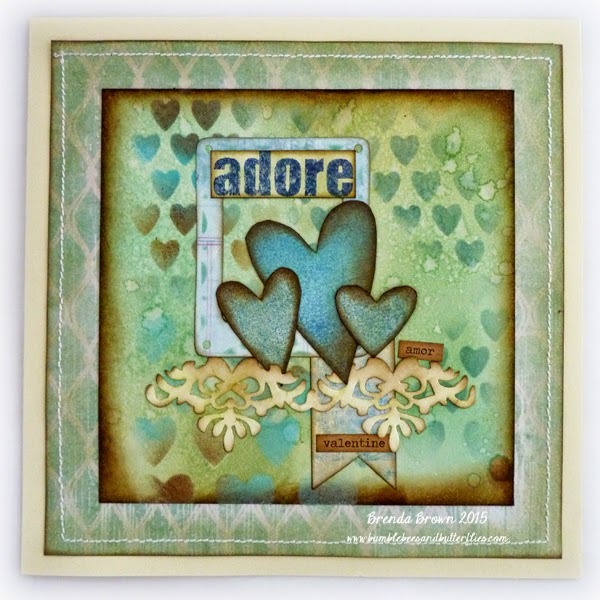 A fabulous card, I love the colours that you've used. Wow, what an elegant Valentine's card....Ken must have loved it! Sorry, I wrote too quick! You made Ken a red one! 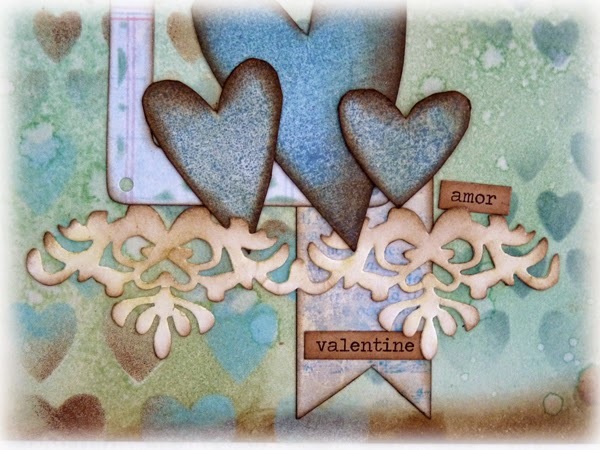 Soper non traditional colours, its a fabulous card. I made my own version of your card as a sympathy card for my cousins when their mom died. Got the sentiments across nicely I think. thanks as always for sharing. Such pretty colours and lovely inky effects. Just been trying to see if I could get to Flitwick for the bookbinding on 29th March, but it looks as though it's a replacement bus service crawling cross country for hours... bah humbug.